A perfect gift to a new couple to add a lovely accent to their new home. Includes a rice bowl server with cover, a round platter and oval platter, a dish server, a tooth pick holder and an astray, 10 soup bowls, soup spoons and sauce plates and 4 plates. 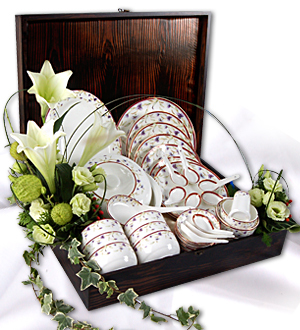 This 46 pc Bingley Dinner Set comes with Lilies. Available in 2 designs. Fresh flowers applicable for Klang Valley only. For other States, fresh flowers will be replaced with artificial flowers or non-flower gifts. Kindly provide at least 3 days notice for outstation delivery. Call 03-78830233 / Whatapps +6012-6915200 or sales@gift-lab.com for more details. Bingley Dinnerware with Madonna Lilies is an ideal gift for Birthday, Anniversary, Housewarming, to Congratulate or simply to say 'Thank You', 'I'm Sorry', 'Well Done' or "Be Happy".